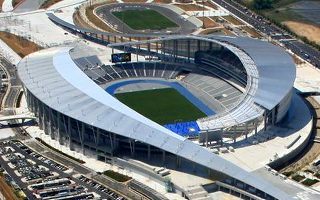 After Incheon’s selection to host the 2014 Asiad in 2007, planning began on the city’s largest sports complex. Populous were commissioned to deliver the concept with its legacy plan and presented their idea in 2009. Together with local partners Heerim, the global company proposed to utilize the plot’s shape. Spanning through almost 1.5km from north to east, the narrow space was organized along its main axis. The stadium’s roof is divided in two halves, both of which run far beyond the stands, both north and south. Lines drawn by the roof are dynamic and supposed to imitate movement, creating a vibrant setting. Mimicked by all access routes, plazas, parking and green areas, the dynamic ‘waves’ are said to resemble the winds of Korea’s coastal city, while another interpretation compares the complex to a dancer. In both variants it’s all about movement and lightness, which are very well expressed. The stadium was initially planned to hold between 60,000-70,000 people, eventually settling near the lower capacity. This tournament layout may well be halved in near future as architects enabled dismantling of the entire eastern side of the stands. While the raised access promenade would remain, these areas may be converted to public green, leaving only the massive western grandstand with 30,000 seats. Worth mentioning, the structures aren’t temporary technical-wise, which allows retaining the larger form as well. Analogically, the stadium wasn’t cheaper just by offering temporary solutions. In fact, the cost went up from early estimates of $300 million to well over $400 million in 2014.